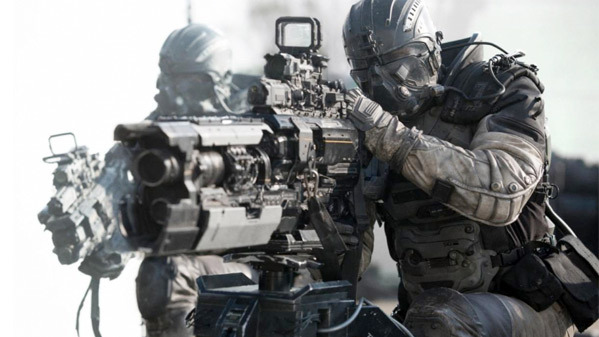 "There's no limit to how far they can spread…" Netflix has unveiled an official trailer for the sci-fi action-thriller titled Spectral, described as "Ghostbusters meets Black Hawk Down." The plot is about a scientist who joins a Delta Forces unit that goes into a European city to investigate "mysterious phantom aggressors code-named Spectral". The cast includes Max Martini, Clayne Crawford, James Badge Dale, Emily Mortimer and Bruce Greenwood. To top it off, this film has a score by Junkie XL, weapons made by Weta Workshop, and VFX by Weta Digital. It seems odd that this is being dumped straight to Netflix, but even better because it means we all get to see it starting next week. This looks cool, I want to check it out. When an otherworldly force wreaks havoc on a war-torn European city, an engineer teams up with an elite Special Ops unit to stop it. A brilliant DARPA scientist joins the Delta Force soldiers into a battle-scarred, war-torn city, where mysterious phantom aggressors code-named Spectral have been causing inexplicable civilian deaths. Spectral is directed by filmmaker Nic Mathieu, making his feature directorial debut. The screenplay is credited to Ian Fried, John Gatins, Jamie Moss, George Nolfi. Legendary produced the film, but is letting it go straight-to-Netflix instead of theaters. Netflix will premiere Spectral streaming on their service starting December 9th later this month. How does it look? Anyone planning to watch? The titles are super good. Wan't there a Final Fantasy movie that was fairly similar in the scary ghost floaty monster thing? No mention of Tambo Cruises Mummy movie on here yet? Reminds me of the movie "the Darkest Hour". Or at least the same concept regarding the bad guys except they did a pretty decent job of explaining WTF was happening. Curious to see what they come up with for this story line. I'd though of the Darkest Hour too, weren't the aliens in some kind of electro suits? that was exactly my first impression! Very interesting. Plus, Leckie from The Pacific is always fun to watch. Oh that works for me, thanks for posting and bringing it to my attention. I'll queue it up behind Fear the Walking Dead, Luke Cage and Ash vs Evil Dead. It's a bit reminiscent of Edge of Tomorrow/Live.Die.Repeat for me, and I LOVE that movie. I hope this plays to the supernatural angle rather than a alien invasion angle. I'm cautiously optimistic, and only because Netflix is firing on all cylinders as far as content is concerned. I think the inference, that its a shame that this has been dummped stright to Netflix is wrong. As a Netflix subscriber I greatly appriciate the content that they have decided to produce, as I feel it is some of the best around. As such I say more power to thier elbow. I admit that some of their original content is not my cup of tea though what dose'nt work for me I'm sure works for others. So quite rightly they dump it stright to thier subcribers as that is what were paying for. I'm also sure that there will come a time when they get to big for thier breeches and decide to have a cinema release of some big budget creation of their own and I look forward to how they pitch to us the subscriber the extra cost I'm sure it will involve.